Hibiscus Plants are often thought of as Hawaiian Hibiscus however they are originally from Asia and the Pacific islands. In fact this is the national flower of Malaysia. However much hybridising has been carried out in Hawaii. The tropical varieties of Hibiscus plants are the most popular and well known, however a number of these varieties are also suitable for cooler climates and are readily available for sale online. 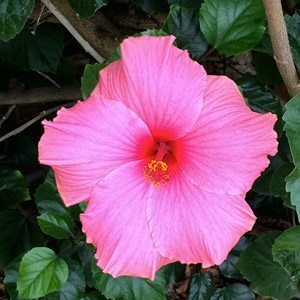 Hibiscus plants require a sunny position and a warm temperate climate, when growing in cooler climates it is best to choose a sunny sheltered position, or perhaps grow your them in a pot on an enclosed patio. Humus rich well drained soil is best, remember this is a plant that does not like to dry out, but like most plants do not like to be waterlogged either. If you are planting your hibiscus in a pot make sure that the potting mix used is free draining. Although they seem like a sub tropical plant, many varieties will grow well in cooler climates and many good specimens can be found in gardens across Melbourne. Most varieties will reach around 1.5 – 2m in height are easy to prune and easy care. A north facing position against a wall is ideal. Protection from cold winds is essential, as is a humus rich moist but well drained soil. Protection from frosts is also essential. If you provide good conditions you can get flowers for nearly 6 months of the year in Melbourne. 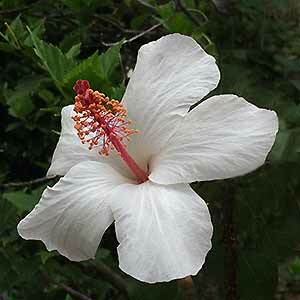 Hibiscus can be pruned in spring, as soon as signs of new growth appear when the weather begins to warm up a little. Make sure you wait until the danger of frosts is over as new growth is easily damaged. If you are considering growing hibiscus in a pot you will need a good quality potting mix, with some added perlite and a good amount of compost. You are trying to create a moist, yet well drained soil. So also consider lifting the pot a little above the ground level to ensure that the drainage holes do not become blocked. Do not let the growing medium dry out, the frost sign of lack of moisture will be leaves turing yellow and then dropping. In pots, the soil tends to dry quickly, so you will need to water regularly. You may consider a drip irrigation system. Fertiliser is important when growing hibiscus in containers, these are hungry plant so regular applications of a slow release pellet type fertiliser formulated for hibiscus will work well. As for growing these wonderful plants indoors, you can do it, however you will need to provide good light, repot them every 2 – 3 years and prune them to make them more compact. H. ‘agnes galt’, a hardy variety for cooler climates with attractive pink flowers. H. rosa sinensis ‘White Kalakaua’, lovely double white flowers. H. ‘Isobel Beard’, with wonderful purple flowers. H. ‘Apple Blossom’, large single white flowers. H. ‘Catavki’, large blood red flowers.